I think the Prisoner of Azkaban is where I really started to think "Hey, this Harry Potter stuff is really cool." The themes started to go beyond just children's themes and into more darker, dramatic and interesting ones. That's not to say the first two Harry Potter movies and books weren't good, of course they were. But with darker themes in the Prisoner Of Azkaban such as characters and ideas like: Sirius Black, Dementors, a werewolf and the Boggarts, I felt that the Harry Potter books and films were something of real substance that every age could get into. Also, there are the great supporting themes of: the Knight Bus; Aunt Marge; Scabbers revealed; Sybil Trelawney; Buckbeak; The Grim; Harry's Firebolt broomstick; The Patronus Charm and so much more! Note: I do NOT own any copyright on this film clip. ALL copyright is attributed to Warner Bros Inc.
By the time it is revealed to Harry that Sirius is really the only family he has left, you had accepted the fact that this person was damaged goods, an unredeemable mass murderer intent on killing Harry if he could. But then it is revealed it is Wormtail that is the murderer and Sirius is after him, not Harry. See how dark the Prisoner Of Azkaban is starting to get! Then there's the "balance" of the Knight Bus, driven by Ernie Prang and his assistant Stan Shunpike (conductor). This provides some great humor in a book that has some very dark moments indeed. When the horn sounds in the movie and the Knight Bus appears it brings a rush of memory and emotion for me, as I grew up with buses of a similar type in Australia when I was a boy. I actually made a model of one of our double-decker models several years ago, similar to the Knight Bus, so a child in one of my classes was able to "drive" around the playground in a parade. You can understand my delight then when I first saw the bus in the movie :)) Additionally, the actual route the bus takes in London is funny in itself, even if it doesn't match up too well with the route taken in the book. If the Knight Bus is fun then Aunt Marge is the direct antithesis of that! A more horrible human being you'd be hard pressed to find because Marge is a bully of the worst kind. She even seems worse that Vernon, if that is possible! You can feel the tension building and building between Harry and Aunt Marge until Harry is left with no choice but to "blow her up" and float her out of the house - and his immediate life! Again, Rowling has created a character that elicits a very strong reaction and we tend to remember stories with characters that elicit strong reactions, positive OR negative! You also get flawed and compromised characters such as Professor Lupin. Although he is a person Harry can look to for help, Lupin is also very dangerous. This is because he is actually a werewolf who, when transformed, could easily kill those supposedly his friends. Indeed, this happens later in the book and film and is in keeping with Rowling's desire to make her characters much more than one dimensional. This is one of the main underlying themes or ideas of the Harry Potter books. But now the tension, even confusion, is ratcheted up a level because poor old Lupin cannot choose the part to act upon. In fact, he's probably unconscious of the fact of anything he does whilst in that state. But the fact that Lupin is a dangerous monster never diminishes for me (and I suspect most people's) fondness for his character. Flawed? Yes! Dangerous? Yes! One of the most loved characters in the Prisoner Of Azkaban? Probably yes! And now to one of my favourite moments of the Prisoner of Azkaban, and perhaps all of Harry Potter. When Harry uses the patronus charm on the Dementors and sends them scurrying away it is one of the most uplifting and stirring scenes I've ever enjoyed. I particularly like the movie version because the build up to that point, and then the release, is magnificently highlighted by the fine musical score when added to the visuals. It's like all the happiness flows back into the world after the Dementors had sucked the life out of it. It is very inspiring and never fails to give me shivers down the spine no matter how many times I watch it. 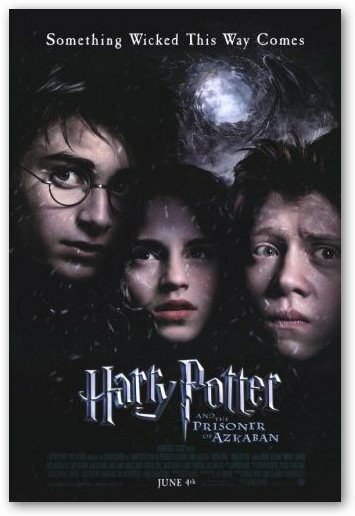 I predict like many other people, I will continue getting pleasure out of watching the movie and reading the book of Prisoner of Azkaban for many years to come.